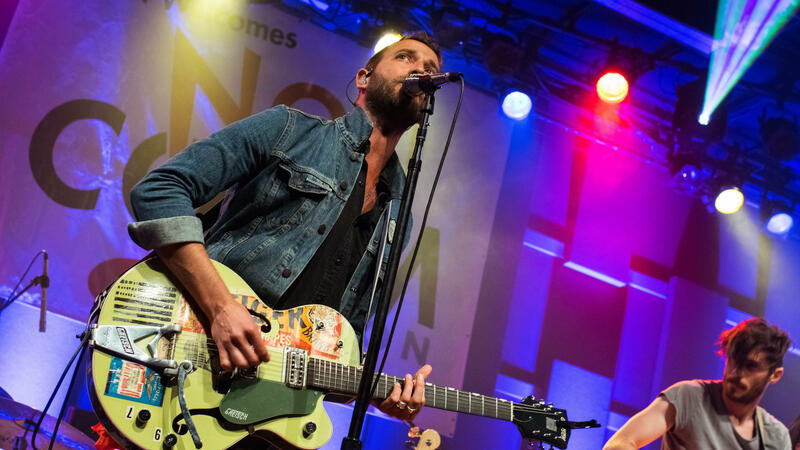 Mondo Cozmo performing live at WXPN's NON-COMMvention at World Cafe Live in Philadelphia, Pa.
You may know Josh Ostrander as Mondo Cozmo, an overnight success that took 15 years to bubble up. Mondo Cozmo's first album, Plastic Soul, was released in 2017 after a string of radio singles including "Shine," which went to No. 1 on the Billboard Adult Alternative charts, and "Hold On To Me." This success has propelled Mondo Cozmo into festival slots, headlining tours and a very different place in the world of rock 'n' roll than Ostrander was in just two years ago. In 2016, the Philadelphia-born musician was holed up in his spare bedroom making music while doing landscaping to make ends meet — this comes after major label deals with his bands, Laguardia and Eastern Conference Champions, going back to the early 2000s. In this session, we go back to hear some powerful live performances from the public radio's NON-COMMvention in Philadelphia last year. Hear it in the player above.